This Cross Pendant measures 13 X 9 millimeters, approximately 1/2-inch by 3/8-inch. Made of 14K Yellow Gold, this piece features a weight of 0.43 grams. It comes ready for gift-giving in a complimentary jewelry box. 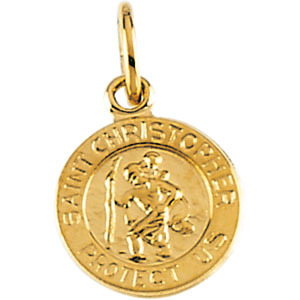 This Round Hollow St. Christopher Medal measures 18.25 millimeters, approximately 3/4-inch round. This 18-inch 10K Yellow Rope Chain With Spring Ring features our money-back guarantee and usually ships the same day if ordered before 6PM Eastern Time. This 20-inch 10K Yellow Rope Chain With Spring Ring features our money-back guarantee and usually ships the same day if ordered before 6PM Eastern Time. Featuring a width of .85mm, this Rope Chain weighs 0.59 grams. Paired with one or more religious pendants, this 20-inch-long chain makes an attractive necklace. This 16-inch 10K Yellow Diamond Cut Cable Chain With Spring Ring features our money-back guarantee and usually ships the same day if ordered before 6PM Eastern Time. Featuring a width of 1mm, this Solid Diamond Cut Cable Chain weighs 0.86 grams. Paired with one or more religious pendants, this 16-inch-long chain makes an attractive necklace. This 16-inch 14K Yellow Gold Solid Cable Chain features our money-back guarantee and usually ships the same day if ordered before 6PM Eastern Time. Featuring a width of .50mm, this Solid Cable Chain weighs 0.34 grams. Paired with one or more religious pendants, this 16-inch-long chain makes an attractive necklace. This 16-inch 14K Yellow Gold .75MM Rope Chain With Lobster Clasp features our money-back guarantee and usually ships the same day if ordered before 6PM Eastern Time. Featuring a width of .75mm, this Rope Chain weighs 0.66 grams. Paired with one or more religious pendants, this 16-inch-long chain makes an attractive necklace.